Several months ago I received an email from Steven Richardson, president of the Hesperian Historical Society of Cawker City, Kansas, asking if I knew anything about a George W. Chapman’s interest in Liberal, Missouri. Chapman was a physician who gave up his practice for the making of shoes, and a geologist who donated his collection to the Cawker City Hesperian library (now the Hesperian Library City Museum). He had a stipulation however, which was that a suitable building had to be completed by Jan. 1, 1885 or he would be sending his collection to an academy in Liberal, Missouri–and by this he would have meant a freethought academy in the town of Liberal, Missouri that had been founded in the 1880 as a freethinker haven. A fortunate turn of events occurred when the newspaper announced that “Old Doc Chapman has thrown up the sponge, given up doctoring and will start a cobbling shop in Smith & Tucker’s old office.” Dr. Chapman offered the Woman’s Club his former office at his residence for use as a public reading room rent free for one year. His mineral collection, which was displayed in the room, was also made available for educational purposes. The women accepted the offer without hesitation. On Dec. 17, the books were moved and soon the new reading room was open Wednesdays and Saturdays from 1 to 5 p.m. Once settled in their new home, the women had time to take note of Dr. Chapman’s geological specimens and consider their educational value. It was decided to petition Dr. Chapman to donate the collection to the Woman’s Club if they would pledge to build a suitable building for it and for the public library. Dr. Chapman accepted their request but with the stipulation that the building must be completed by Jan. 1, 1885. If they failed to meet the deadline, his collection was destined for an academy in Liberal, Mo. The building, with a few delays, was nearly completed by the end of 1884, but had to wait until April for its plastering. Unfortunately, I was unable to provide Steven Richardson any information on Chapman’s association with Liberal, and after looking here and there I’m still unable to elaborate. Chapman was certainly an individual who would have been interested in Walser’s experiment with a freethought community when it was founded and began filling with people in the early 1880s, but he would likely have been later disappointed in its turn to spiritualism. MR. EDITOR–This morning I found a card that had been slipped under my door during the night, it has printed on it; have I given my time and talent to the cause of Christ or to the devil; and on the other side is printed, why am I not a Christian? Now I wish to tell this cowardly night sneak that if he or she having a respectable backing, wish to hear my reasons for my Christian unbelief, they have only to command courage enough to step on to a free platform and I will pay all expenses, and will pay them as much money as any other person of this city receives for the same time of labor, and the challenge extends to all persons every where. George Chapman lived by himself and proved difficult to find on the census. As he was interested in Liberal, and Mineral in Jasper County, Missouri is but 30 miles from it, though his bio gives him as moving to Waconda in 1871 from Canada, I’ve decided he must be a George W. Chapman, a doctor who is found in the 1870 and 1880 census in Mineral who also gave himself as widowed. What clinches it for me that they are one and the same man is that the 1880 census shows the George W. Chapman in Mineral is maimed or crippled. George W. Chapman of Cawker was maimed, having lost a leg as a child. It seems, then, that Chapman, as he is given as settling in Waconda, Kansas on Sept. 1 of 1871, and residing there until he settled in Cawker City in 1880 (or 1885, two dates for moving are given), was traveling back and forth from Kansas to Mineral, Jasper, Missouri, close to where Liberal was founded. The 1870 census shows him in Jasper County, Missouri. In 1875, he is in Cawker. In 1880 he is back in Mineral, boarding in the household of Judge Charles E. Elliott who was married to a Maria D. Holbrook (her parents were born in France). Elliott, also from England, had come to the U.S. from Ontario, Canada in 1856. Elliott’s bio gives that he was one of only 2 men in southwestern Missouri who voted for Abraham Lincoln in 1860, then fled to Kansas with the Civil War, where he enlisted in Company C, Sixth Kansas Volunteer Infantry. After the war, he returned to Missouri. Given Chapman’s interest in minerals, I think it’s notable that Mineral was a mining town. In 1885, Chapman was recorded in the Kansas census. I am unable to locate Chapman in the 1895 Kansas census. Chapman’s will reveled he had a son, George Chapman, as well as a son and one or two daughters whose names and addresses were unknown to him. George Chapman of Dumont, Clear Creek Colorado is the known son and I’ve located him in the Dumont census in 1900. He was also widowed, and as his eldest daughter was not born until 1873, it will be pretty much impossible to locate him on any earlier census. I have tried and not been able to find him. The 1910 census shows George Chapman in Lemon, Clear Creek, Colorado. His date of immigration isn’t given in the 1900 census but it is in the 1910. He is stated as immigrating in 1856, which happens to be the same year that Judge Charles E. Elliott had immigrated from Canada, the individual with whom the elder Chapman was boarding in 1880. Is this purely coincidental? Interestingly, in 1860, Charles E. Elliott was living in Neosho, Newton, Missouri in the house of Andrew Tibbetts who was a 29 year old shoemaker from Indiana. That seems also somehow relevant considering George Chapman was also a shoemaker. There aren’t many of those in the census. It seems that George W. Chapman may have then immigrated as early as 1856. I am, however, unable to locate him in the 1860 census. Letters of George Chapman to the local newspaper reveal he had a fervent interest in the area and how it might best profit, expounding on silk worms, bees, apples, mining and other subjects. Every so often a report, too, would be made of a new acquisition to his mineral trove. Only 4 months before his death he wrote suggesting the town, having acquired a library, should now get a good restaurant. 3 months before his death he wrote of having, after 20 years, managed to trade some of the rocks for coral, and extended an invitation for people to view the specimens. Given that he had such a fondness for writing, I had thought I might find via Google Books letters he may have written to any freethought publications, but I’ve come across none. 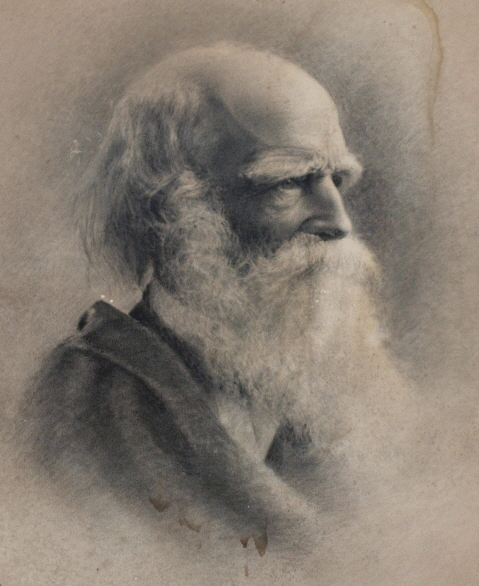 George W. Chapman died the 1st of August, 1898. One by one the old timers are passing away. It has been the duty of the RECORD in the past fifteen years to chronicle the deaths of many of the early settlers of this locality, but among them all none were so noted for peculiar characteristics as Dr. Chapman who died on Monday morning, the 1st, at his home in this city. George W. Chapman was born December 27th, 1818, at Great Missenden, Buckinghamshire, England. While yet a small boy he lost his leg by amputation made necessary from white swelling. When about twenty years of age he left England for Canada, where he remained until his removal to the Solomon Valley, settling at Waconda, Sept. 1st, 1971. He established a shoe store, later adding a stock of drugs, and, having acquired a knowledge of medicine and law in his younger days, practiced as a physician and lawyer, and in recent years he has signed communications as “Cobbler and M.D.” He was also Justice of the Peace, and early settlers tell of some queer and arbitrary decisions made by him. Waconda was the frontier town of its day but Cawker City gained the ascendancy in 1871 by A. Parker locating his store here, and the decline of Waconda began, the settlers gradually moving themselves and buildings to Cawker City, Dr. Chapman vehemently protesting against the removal of the buildings, and tenaciously maintained his home there, the gable of his residence decorated with geological specimens which he had collected. But the Doctor finally succumbed to the inevitable and in 1884 moved to this place, bought a residence and later rebuilt, which he occupied as his home and shoe shop until the day of his death. The Doctor was a geologist and had made large collections of mineralogical and geological specimens, the most valuable of which he presented to the Woman’s Hesperian Club of this city with the understanding that they were to erect and pay for a Library building before they acquire ownership to the collection, which they did, and thus Cawker is indebted to Dr. Chapman for the Library, building and collection of specimens. Dr. Chapman was very peculiar in his habits and manner living nearly the life of a hermit, for he repelled rather than attracted those who would have been friendly with him. He was a pronounced infidel and never neglected an opportunity to express his peculiar views, but he was strictly honest in his limited dealings with his fellow men, and though crippled, he was not dependent upon others for support, but was very frugal and always had a little surplus of money. His will names D. C. Everson, J. G. McClun and M. Meibergen as executors. Judge Smith stated that he had known the deceased 27 years and his whole life had seemed to be an ?, that he would question himself as severely as any one else or his position of today he would question tomorrow. H. S. Potter stated that it is written: “Pure and undefiled religion is to visit the widow and fatherless in their affliction, and keep yourself unspotted from the world,” this the Doctor had done, when not able to visit he had put his hands in his pocket to help them. Mrs. Alrich stated that it did not seem a mere chance that led Dr. Chapman to collect the mineral cabinet, and Mrs. M. L. Berry to interest women in a Library, and that their united efforts gave us the Library we now enjoy; also that though the two founders were dead, who plowed or sowed, matters not to the reaper in the harvest, we are only remembered by what we have done. Rev. Aller spoke as a citizen that though they could not ask him as a minister, and that probably the Doctor would have requested that he be not present, he could not help testifying to the interest he had felt in him; and that the utterance of his last days had shown there was a pent up longing within, to know something of a hereafter–that this life was not the end. The remains were interred in the Prairie Grove Cemetery. Two sons are known to survive the deceased, one George Chapman, a miner residing at Dumont, Col., and another in Denver. Waconda would be Wakonda, which is an American Indian name for the unseen, mysterious force, or spirit, that is in all and unifies all. UPDATE: Had Liberal received Chapman’s geological specimens, instead of Cawker, they would have perhaps received a portion of the meteorite Chapman discovered in Kansas in 1873. The story about it is here. UPDATE (November 19 2011): Another utopian colony with which George Chapman was involved was Silkville in Kansas, where he lived for a year. Out West has more information on this discovery. The name of the town suits what industry was intended for the community, that of silk farming. The utopian Alphadelphia Association was, as well, interested in the production of silk, both communities inspired by Albert Brisbane, a U.S. “disciple” of Charles Fourier. Henry R. Schetterly, who founded Alphadelphia, is given as a “disciple” of Brisbane, and Ernest Valeton de Boissiere, the French founder of Silkville, involved the utopians Albert Brisbane and E. P. Grant in the Silkville venture, meeting them in 1868, but I read that of them only de Boissiere remained, the hardships of life in Kansas proving too much for Grant and Brisbane. There was perhaps talk of silk at Liberal, MO, for Victor Hugo Noyes, whose father and grandfather had been at Alphadelphia, traveling to India and China in the 1880s, brought home silkworms and had the opportunity in his short life to experiment some with producing it. I have a Holy Bible The Gift of Worshipful Company of Stationers to G.W. Chapman dated the 5 October 1886. Sakhile, I’m not a relation of G. W. Chapman. You might want to post about it below where they have a long running thread on Chapman.